Volume computed tomography dose index (CTDIvol) and dose length product (DLP) values are fre- quently used to represent radiation doses from a CT scan. The limitation of CTDIvol and DLP is that they are surrogates for patient dose, providing information about the scanner output for only a very specific standardized condition . The dose received by a patient depends on both patient size and scanner output. Turner et al. showed that using CTDIvol as a normalization factor, organ dose esti- mates can be obtained for a specific patient size , and that the relationship to patient size was con- sistent across scanner models . Their results showed a promising approach to estimating size- dependent, scanner-specific, and exam-specific organ doses based on patient size and the CTDIvol reported by the scanner. Hence, obtaining accurate information about patient size is crucial to estimat- ing patient dose in CT.
Report 204 from the American Association of Physicists in Medicine (AAPM) described the use of a size metric that involved the physical dimensions of the patient (anteroposterior [AP], lateral, AP+lateral, or effective diameter), in combination with scanner output (CTDIvol), to determine size-specific dose estimates (SSDE) from CT scanning . Patient dimension can be determined using physical or electronic tools. Physical devices, such as the calipers that were frequently used in radiog- raphy before the routine use of phototiming, may be used to measure patient thickness in the AP or lateral directions. Alternatively, electronic measurement tools can be used to measure physical dimen- sions from either the CT localizer radiograph or an axial CT image. The conversion factors used tocalculate SSDE from CTDIvol reported in AAPM Report 204 were derived from experimental and Monte Carlo data and normalized to patient size in terms of water- or tissue-equivalent materials. For the task of calculating SSDE, geometric size was used as a surrogate for a patient’s x-ray attenuation. However, x-ray attenuation is the fundamental physical parameter affecting the absorption of x-rays and is thus more relevant than geometric patient size in determining the radiation dose absorbed by the patient. For example, regions of the thorax and abdomen could have the same external physical dimensions. However, because the lungs are less dense and of different composition than abdominal tissue, the thorax would attenuate fewer x-ray photons than would the abdomen. For the same scanner output (CTDIvol), the thorax region would experience a higher radiation fluence and, hence, have a higher absorbed dose than an abdominal region having the same geometric dimensions. While CT operators can measure a patient’s AP or lateral width, they currently have no practical way to measure attenuation. Both a CT localizer radiograph and CT projection data are measurements of the integrated x-ray attenuation along a ray path, and a CT image is a cross-sectional map of the linear attenuation coefficients of the materials in the image, normalized to the linear attenuation of water. Therefore, the CT localizer radiograph, the CT projection data, and the CT image all contain information that can be used to estimate patient attenuation. 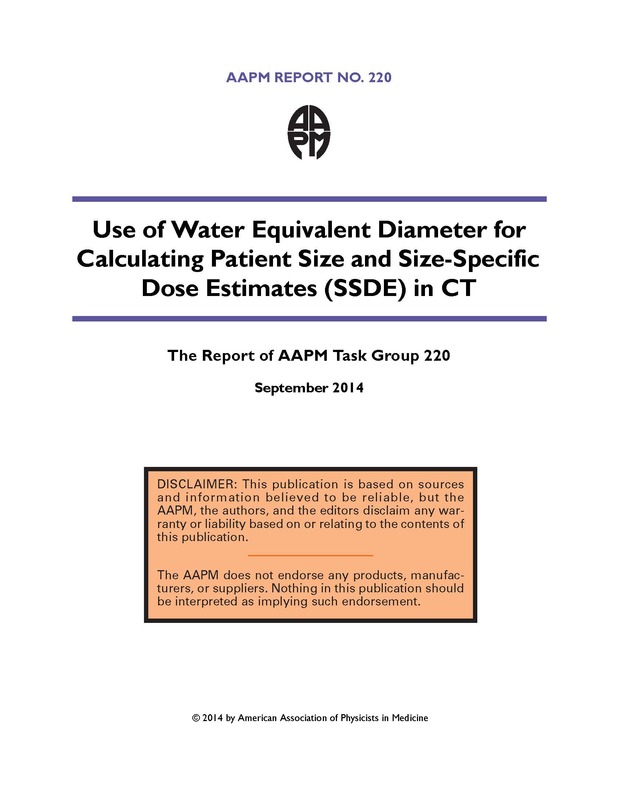 The charge of AAPM Task Group 220 was to develop a robust and scientifically sound metric for automatically estimating patient size in CT that would account for patient attenuation and allow rou- tine determination of SSDE for all patients, with little or no user intervention. This task group had a specific goal of developing a practical, standardized approach to estimating patient size that could be implemented by CT scanner manufacturers and others using CT localizer radiographs, axial CT images, or other data derived from the scanning process (e.g., projection data). Advantages and limita- tions of different methods were considered during task group deliberations and are summarized in this report. This includes comparing the SSDE calculated using various geometric size metrics, such as AP or lateral dimensions and effective diameter, and attenuation metrics, such as water equivalent diameter. Finally, recommendations are presented on the adoption and implementation of a standardized approach to estimating patient size. This report is organized as follows. First, the concept of water equivalent diameter (Dw) is presented, and the methodology of calculating it from either a CT image or a CT localizer radiograph image is described. Second, data are provided comparing the accuracy of Monte Carlo dose estimates made using geometrical-based versus attenuation-based metrics for a series of virtual abdomen and thorax phantoms and their respective virtual CT images, and for patient images. Third, data are pro- vided comparing Dw calculations from CT image and CT localizer radiograph phantom measurements. Fourth, practical considerations involved in implementing either approach are discussed, and recommendations for users and for manufacturers are provided. Finally, a road map for commercial adoption is suggested such that both patient size and SSDE can be calculated in a robust and consistent fashion across CT scanner manufacturers, and the resultant values stored in either the DICOM image header or the DICOM-structured dose report.